In observance of Maundy Thursday and Good Friday, our offices and Customer Care Centers will be closed on April 18-19. Regular operations will resume on April 22, Monday. In observance of Maundy Thursday and Good Friday, our offices and Customer Care Centers will be closed on April 18-19. Regular operations will resume on April 22, Monday. Canon propels Filipino hobbyists and small entrepreneurs to bring to life new-age business ideas with the G-Series line boasting its borderless, limitless in service satisfaction features. Manila, Philippines – With the Philippines becoming more and more a digital nation because of the internet and the rapidly advancing technology these days, it is no doubt that the way people start and operate their businesses has also transformed significantly. Canon makes it even simpler for the highly-creative and business savvy Filipinos, who are work-at-home parents, students, start-up entrepreneurs, and hobbyists, to develop their passions and innate potential into ambitious business opportunities with the newest Canon PIXMA G Series printers. “With Filipinos becoming more influenced and looking into turning their hobbies into potential lucrative opportunities, Canon aims to provide their needs with the expertise, right tools, and technology to help them succeed. We aim to make starting businesses more delightful for anyone, building their dream ventures from simple passion projects and creative ideas with a companion they can truly trust.” shares Benny Yu, CMPI Head of Consumer Imaging and Information Division. 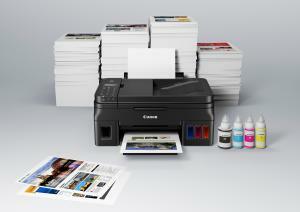 There are many ways by which the new Canon PIXMA G Series printers can help creative individuals start their own business. It is the entrepreneur’s best bet to address business’ printing needs with its unique design, printing quality, hardware durability, versatility, and high-volume production printing capability at low cost per print—thanks to its affordable inks at P295 per bottle, which can yield 7,000 colored prints and 6,000 black & white prints. It also champions convenience perfect for students, moms or hobbyists with its built-in Wi-Fi features that can help print from anywhere, coupled with borderless photo printing, PosterArtist Lite app, and Creative Park access to help create anyone’s own arts and crafts into sellable merchandise. During the fun-filled launch event, the digital imaging brand also showcased the three unique specialty features of the new Canon PIXMA G Series printers, which were borderless printing and creative features, value for money, and a hassle free-warranty with improved after sales services. Atop its quality and built-in features, users can also enjoy two years of confident printing and additional confidence boost with the top up option for warranty extension – no need for printing capacity to avail of warranty. With up to 12,000 black prints extra mileage (free black ink for PIXMA G2010), and free pick-up and delivery for repairs within Metro Manila up to 3 months within purchase, users can be free of worries and hassles making their start-up business work flow and operations more efficient.